12 April - 29 September. 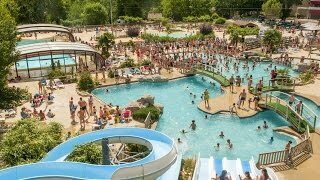 This Franceloc holiday resort has been built on a grand scale and offers 440 mobile homes and chalets, two gîte villages, a hotel and 160 camping pitches. These are on scrub grass with some shade from mature trees and 6A electricity (long leads may be helpful). For those looking for organised activities, in high season this complex has it all, but fewer are arranged in low season. Most are found by the hotel which is about 1 km. from the camping area along a descending site road. 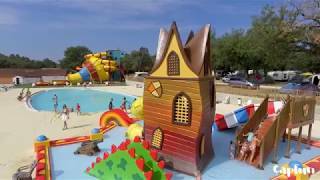 There is a large, exciting and well designed pool complex and in high season there are evening shows and dancing. There is a free shuttle service around the campsite in high season. Two fully equipped sanitary units. Facilities for children and disabled visitors. Laundry. Well stocked supermarket (site is quite remote). ATM. Bars and restaurants, takeaway (those by the pools are open all season). Two pool complexes (heated) with excellent water chutes. Themed adventure play area. Tennis. Bicycle hire. Quad bikes (school holidays). Riding. Aerial walkways and zip wires. Activity clubs for all ages and entertainment (high season). No charcoal barbecues (communal provided). WiFi on part of site (free). Site is approx. 15 km. southwest of Montélimar. From the N86 Bagnols-Aubanas road take the D4 at Bourg-St-Andéol and follow it to St Remèze (best road for touring units). Turn right at roundabout just before St Remèze on to D362 towards Larnas. Continue on this road when it changes to D262 and site is on the right in Imbours. Do not attempt other routes with a caravan or large motorhome.